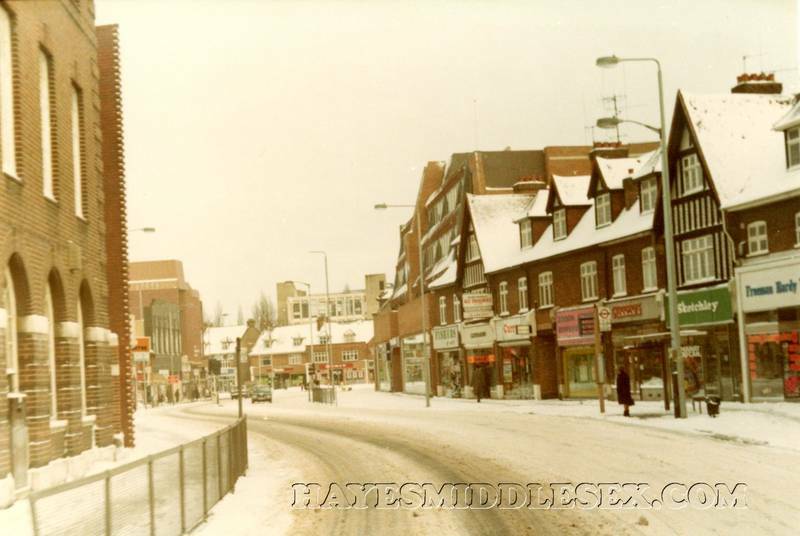 These pictures of a white-out in Hayes Town were taken by Eric Hayles late 1978 or early 1979. This must be after Sandgate Hall had gone. It was in it's own grounds next to where Fishers was. There was a lawn in front of the building with a huge tree. At Christmas it was always lit up with coloured lights. Outdoor lights and decorations were not as common as they are now and so the tree was always a lovely sight, especially the few days leading up to Christmas Eve when it would be getting dark before 5 p.m. and the sky would be looking grey and heavy with the prospect of snow before the night was out. It's a tragedy that building went. That ugly building next to Fishers is what replaced it. Click through to the full size pic for a closer look. I remember how shocked I was when I saw, years later, how that area had been filled in with a shop and car-park above. I am glad I still have a clear memory of how it used to be. My paternal Grandmother had lived in accomodation over Turners, the shoe-shop, which would have been the beginning of the shops as they continued towards Coldharbour Lane after Sandgate Hall. A bus stop shelter and a bin! There is a great comparison between the old accommodation above the shops there to the store with a car-park above it further on (which is only in the distance of the photo. They are attractive and have character, I think. You're so right. Shops nowadays look so bland. Not long ago I walked with friends through Uxbridge, who had never been there before, and as we turned the corner into Windsor Street they both were impressed by the old shops up that hill. With all the development around it the scne has hardly changed since the Fifties. There are two parades of shops I can think of which resemble that old-fashioned style of building. Although they were built later, they show the other previously built more 'bland' buildings up to be just functional. This is not in Hayes but further away. Windsor Street hopefully will remain unchanged as seeing it is like going back in time with the old buildings there being such strong reminders of the past. I'm afraid town planning in the second half of the 20th century in the UK was a total disaster. Let's hope the 21st century will be better! I doubt it somehow, and I think the internet will increasingly consign shops to history anyway.